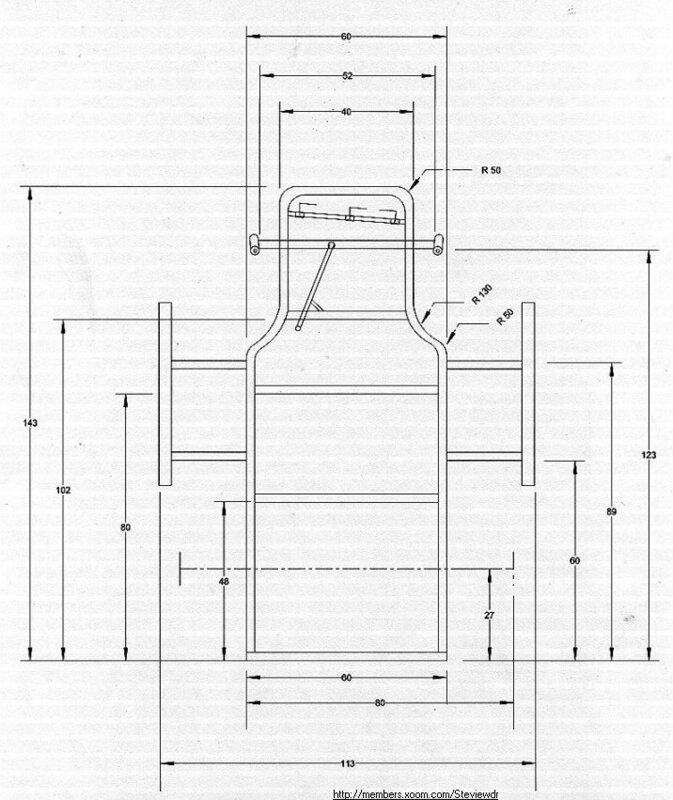 This is the layout for a Kart seating an average person but it is advised that you roughly lays out this design on the ground, placing a wheel at all four corners, the seat and the engine side by side. The measurements given below will not need to be altered much as there is room for movement for a bigger seat and/or bigger engine on both sides. My advice on going to construct this is to draw out the shape below on a 8 * 4 foot sheet of plywood, if your desperate you can draw it out on a strip of felt underlay with chalk. But the sheet of ply is the much better option, as you can work from this right through out the welding and bending operations what you can do is place all the sections of pipe cut to the exact length on this sheet, drive in nails both sides of the pipe and weld all the sections togethor without too much distorsion taking place. But be ware of fires. I'll take no responsibility if you burn your house down. A welder is a necessity in this entire projct. It doesn't have to weigh a ton, a small 120 amp welder will be suffieient. I only have a 100 amp welder and I have to be very patient with it. But I got my Kart built. If all you have is a 100 amp welder or less you will definately need to use 2.5 SWG welding rods. This is the most important section of the entire Kart, spend a good week or two making this section. Have no holes in the joints or anywhere for that matter. If this section is constructed well it will serve you for years and for a number of engines. Mine went through 4 major engine and drive changes as ca be seen in my "Pictures of various karts.." at my homepage.